Tata Group’s Infiniti Retail Ltd, which owns the Croma electronics retail chain, is in talks with e-commerce major Amazon to roll out voice command-integrated products this year under its private label. While television and speakers are expected to be the first to have this integration, other products including lighting and curtain openers are poised to be integrated with voice command later. “Talks are on with Amazon but haven't been finalised yet. However, we intend to launch 1-2 products this year which can interact and respond to voice commands. Amazon has the technology and we have the products under our private label,” said Avijit Mitra, executive director and CEO at Infiniti Retail. It is yet to be decided if these products, from Infiniti Retail’s stable, will be co-branded with Croma and Amazon’s Alexa. In 2013, Infiniti Retail first launched its private label under the brand-name, Croma to reflect the retail chain’s name. Currently, the private label makes up 6-7 per cent of Croma’s annual sales of Rs 4,800 crore. Mitra said prices of the products, once integrated with voice command, are expected to go up although the company is yet to decide the extent of price surge. “Some of it we will absorb, and some of it has to be passed on to the consumer,” he said. Advances in machine learning and adding billions of facts in the Alexa technology has improved its ability to understand requests and answer questions by more than 20 per cent in 2018, while developers doubled the number of Alexa skills to over 80,000, and customers spoke to Alexa tens of billions more times in 2018 compared to 2017. Mitra opined that with the fast adoption of voice command-based gadgets, a section of consumers would be drawn towards such technology improvements, which would help further sales. With an ambitious target to open 65 new stores in the current fiscal year, Infiniti Retail has come up with two new methods to improve its profitability and reduce costs. Firstly, at the group level, it is placing adjacent stores in partnership with Tata Group companies like Croma, Starbucks, Westside, Tanishq and other brands in the same premises, which can potentially reduce the rent by 10-20 per cent. On the other hand, such integration may help Group companies harness the customer footfall as well. “We are working closely with our other group companies to leverage the synergy,” Mitra said. The Group already has such a common premises in the Kormangala area in Bengaluru and is coming up with another one in the Rajahat area near Kolkata, where two other Tata Group brands apart from Croma will be placed adjacent in a common premises. 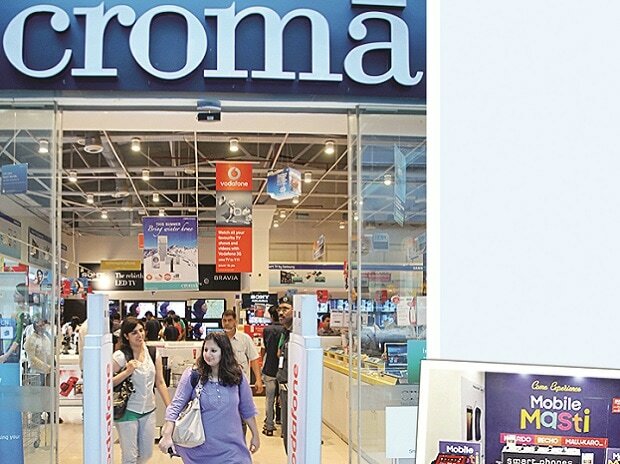 Since its inception in 2006 till last year, Croma’s total store count stood at 130, with the 100th store up in 2012-13. However, this fiscal year, the growth in store count has been set at 50 per cent. Around 98 per cent of the existing stores are profitable. Secondly, after an initial testing of the franchisee model of retail store ownership in Mumbai, Infiniti Retail, will be extending it this year. Of the 65 stores planned this year, 15 are expected to be based on the franchisee model. Typically, each store requires an investment of Rs 2 crore as capital expenditure and another Rs 2 crore as working capital. “If the franchisee model is successful, over a period of time, 50 per cent of the total stores may be franchisee ones which will also help us to get asset light,” Mitra said. On how Infiniti Retail plans to minimise its accumulated losses of around Rs 650-700 crore, Mitra said economies of scale coupled with higher reach across India will help mitigate these losses.